[Lahore: 12th October, 2013]: The pioneering Pakistan Fashion Design Council [PFDC] and L’Oréal Paris, the world’s leading beauty brand, presented Day-2 of the third consecutive PFDC L’Oréal Paris Bridal Week 2013 – a platform that endeavors to define and present contemporary and traditional Pakistani Bridal fashion and make-up trends, fusing to create the ‘look’ for the bridal season 2013-2014! The second day of bridal week opened with early evening bridal showcases by Nickie Nina and Sadaf Malaterre followed by late evening shows with collections from Fahad Hussayn, Misha Lakhani and Sonia Azhar with the evening’s finale presented by Ali Xeeshan as summarized below. Make-up for Day-2 of PFDC L’Oréal Paris Bridal Week 2013 was done by the creative team at Maram & Aabroo, hair styling by TONI&GUY - Lahore with male models styled by Khawar Riaz. 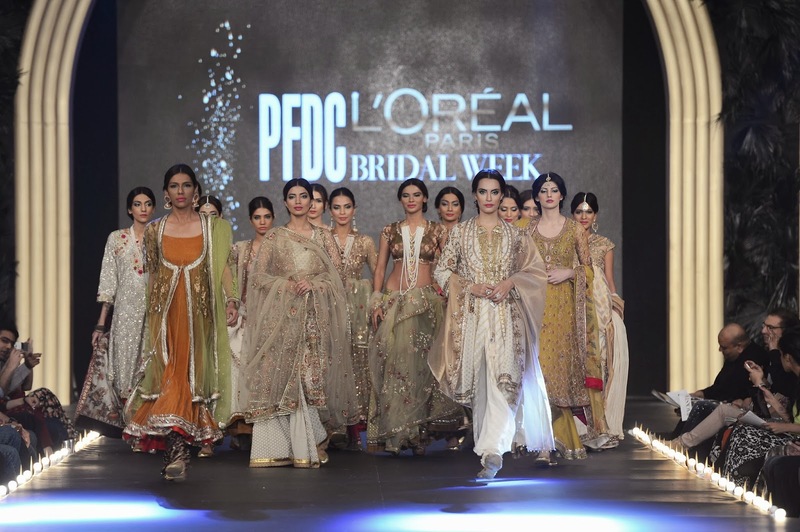 In celebration of its 26 years of publishing, Libas International Magazine Limited, premier lifestyle and fashion magazine that celebrates the achievements of the Asian Subcontinent, are hosting the official black carpet at PFDC L’Oréal Paris Bridal Week. Indeed, Libas encompasses the richness and versatility of Pakistani heritage and highlights its relevance in today's world. playing a pivotal role in promoting the enlightened side of Pakistan. L’Oréal Paris also created an exclusive make-up look in collaboration with PFDC member designer Fahad Hussayn on Day-2 of PFDC L’Oréal Paris Bridal Week in association with the participating Bridal Week style teams of Maram & Aabroo and Toni&Guy – Lahore. In addition to this, L’Oréal Paris hosted a customised Beauty lounge at PLBW where they exhibited a special edition PLBW Bridal Make-Up Kit, which can be used to recreate favourite make-up looks from PLBW 2013, and an Essie Nail Bar where visitors experienced the brand’s acclaimed nail colour range firsthand. L’Oréal Paris also showcased their Revolutionary Revitalift LaserX3 product range at PLBW and hosted a unique laser-installation where Bridal Week patrons were invited to experience complementary product sampling. In continuation of the trend set at the debut PLBW by the brand, L’Oréal Paris also published and shared their signature newsletters on Day-2 of the event.